As Chicagoland’s premier furnace repair company, we realize that no heat is no option. That's why Mr. Duct furnace heating repair all over the entire Chicagoland area! 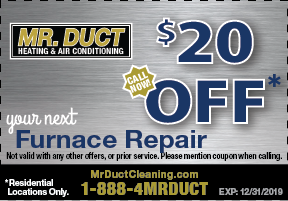 With knowledgeable office staff and service technicians available, you can rest easy knowing that Mr. Duct has your back!